Sir William Castell, Chairman of the Wellcome Trust, presents awards to winners. 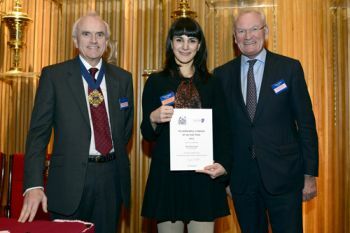 Florin Creanga and Homa Naseri have won the 2013 Salters' Institute Prize for Exceptional Achievement in Physical Sciences. This award is presented annually to two outstanding students from City University London's School of Engineering & Mathematical Sciences (SEMS) in recognition of their exceptional educational achievements. 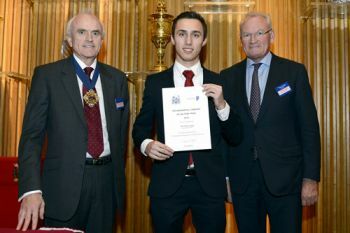 Florin, a second-year student on the BEng Electrical and Electronic Engineering course and Homa, a third-year MEng Mechanical Engineering degree candidate, received their awards during a ceremony held at The Salters' Hall on 29th November. Chairman of the Wellcome Trust, Sir William Castell, presented the Prize to the awardees and addressed the audience attending the ceremony. Taking its origins in medieval London's salt trade, The Salters' Company was first licensed in 1394. It is ranked ninth in order of precedence as one of the Great 12 Livery Companies of the City of London. It is a diverse organisation responsible for several charitable foundations and carries out significant philanthropic work in science education and fostering fellowship among its members. "Yet again, two of our best students are the recipients of this prestigious prize at a ceremony celebrating the achievements of outstanding young people across the UK. We are grateful to the Salters' Company for the continued assistance extended to our students". "Being awarded this prestigious prize from the Salters Company has motivated me to succeed in life and achieve my goals through learning. While attending the awards ceremony I met students and professors from other UK higher education institutions such as Cambridge, Manchester and Glasgow Universities who are equally passionate about engineering. This was a source of great encouragement for further success in my studies and future career. I would very much like to thank Professor Khan and the Salters' Institute for selecting me for this award as well as all of the other excellent professors who have taught me at City." "I would like to thank City for providing me with the opportunity to progress in my studies and or nominating me for such a prestigious award. To be in the presence of other high-achieving students from many parts of the UK while also meeting engineering professionals and being congratulated in such a special forum, is definitely an added boost. Sir Castell's address to the audience was inspiring because he encouraged us to be the leading engineers for future technologies." Please click here for more information on The Salters' Company.